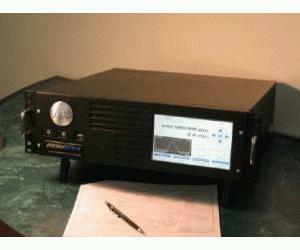 The precisionWave p1411A is an economical, focused performance modulated or CW RF vector signal generator. The source covers the primary cellular bands, 800 MHz – 1000 MHz and 1700 MHz – 2200 MHz. The instrument has a wide power output range, -100 dBm to +20 dBm, coupled with excellent phase noise performance. The p1411A is a highly accurate source of quality EDGE, GSM, IS-95 (CDMA One), NADC, PHS, WCDMA, etc. signals. The p1411A can be internally or externally modulated, and includes a powerful internal I and Q waveform generator. With a highly stable 10 MHz internal frequency reference, the source can also accept an external 10 MHz reference signal for synchronization with other devices and test equipment. The source can be used on a bench or mounted in a standard 19 inch rack using only 3U (5 ¼ inch) of vertical rack space. The p1411A measures 17 inches in depth. A crystal clear 7 inch TFT display includes a touch panel for easy instrument control without mouse, stylus or keyboard requirements, though these may be used if desired. The exclusive precisionWave Spectrum Analyzer display (patent-pending) gives constant visibility of the signal being generated without tying up an expensive spectrum analyzer! Used in preview mode, the Spectrum Analyzer feature assures that the proper IQ waveform is selected for output. A standard LAN programming interface with a robust and intuitive API speeds and simplifies development of automated R&D or Manufacturing software applications within Microsoft Visual Studio or Visual Studio .NET environments. The p1411A is completely interchangeable with the precisionWave p1211X ATE RF Signal Generator for applications making use of external modulation. This results in an economical leverage strategy for software cross-development and maintenance between R&D and manufacturing.